Ayurveda, the ancient healing system from India, aims to alleviate suffering by treating the root cause of disease according to our unique constitution, while promoting longevity, balance and happiness. Ayurveda, meaning 'knowledge of life' is the 5000 year old ancient healing system from India that promotes longevity, balance and happiness. Ayurveda aims to alleviate suffering by treating the root cause of disease according to our unique constitution, known in the ancient language Sanskrit as Prakriti. This is the unique mix of three biophysical forces (doshas): Vata, Pitta and Kapha, which comprise the elements of Ether/Air, Fire/Water and Water/Earth respectively.Less suitable life choices and general life stresses can lead to imbalance in our constitution leaving us vulnerable to those ailments and conditions to which we may be genetically and constitutionally susceptible. Harmonising more closely with the rhythms of nature and rebalancing our constitution through appropriate nutrition, herbs, exercise, relaxation and lifestyle choices together with Ayurvedic therapies, can help to restores health and prevent disease while improving our vitality and happiness. 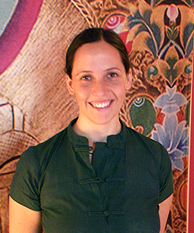 Angie Fraser-Moore is a fully qualified Ayurvedic Practitioner practicing as 'Ayurvedic Me'. The goal of Ayurvedic Me is to promote health and manage disease using the timeless principles of Ayurveda, the ancient practical healing system of India, and Yoga. Angie's fascination with Ayurveda developed from discovering the healing powers of its sister science, Yoga, and quickly grew into a passion to use this knowledge to help promote wellbeing in the modern world. This sparked the pursuit of a five-year training programme with Middlesex University where she gained a Master of Science in Ayurvedic Medicine and first class honours (BSc) degree in Complementary Health Sciences (Ayurveda). Extensive therapeutic training in the UK and India was included as well as independent clinical research on stress, in which she specialized and gained an award of distinction. Angie is qualified to teach Hatha Yoga based on the Sivananda tradition incorporating Asanas (postures), Pranayama (breathing exercises), guided relaxation and Meditation. For several years Angie served as a board member of the Ayurvedic Practitioners Association (APA) while co-ordinating the student clinical programme for Ayurvedic Medicine at Middlesex University where she also gave lectures on Ayurveda and Yoga. Angie previously invested a decade studying the biosciences of Immunology and Pharmacology and writing about health and disease management from a western medical perspective as a professional editor. Angie's combined knowledge and understanding of Ayurveda, Yoga and western medicine provides a unique and balanced perspective on how to address and treat the ailments of the modern world while lighting the candles of self-awareness and healing. After many years practicing in London, Ayurvedic Me is now based in Inverkip on the Clyde Coast offering workshops and consultations along with various Ayurvedic treatments. Angie warmly invites you to get in touch.